Hard work pays off but it sure does take a toll on your hands. Exposing yourself to dirt while gardening and typical industrial grime can leave you susceptible to loads of infections and unwanted chemicals. Not to mention the risks of cuts and bruises that can leave you in pain for days, even weeks. Get yourself protected with Xpose Safety's powerful Work Gloves, tailored to protect your hands from the most extreme of activities so you can get your jobs done with ultimate satisfaction and comfort! Great for Construction, Gardening, Farming, Shipping, Utility Workers, and More! When it comes to improved safety, there's no other product that can do it better! Our Work Gloves provide a layer of security that cannot be beat. Being the perfect thickness to ensure incredible guardianship to your hands but not too thick that it feels heavy and clunky on your hands. The premium polyester and cotton blend is the ideal material for rough, extensive use - top-notch durability to last a long time and improved strength to handle the toughest of jobs. With so much to offer, you'll almost always find that our gloves are the perfect choice to accompany you in any situation. Great support when you're heavy lifting so your hands don't get sore or callused, ideal protection against dirt and grime so that you don't introduce your body with harmful bacteria, an extra superior layer of thick material so you don't get cuts or bruises when doing strenuous work, enhanced warmth when working outdoors in severe weather, the list goes on and on! Expose yourself to safety with Xpose Safety! 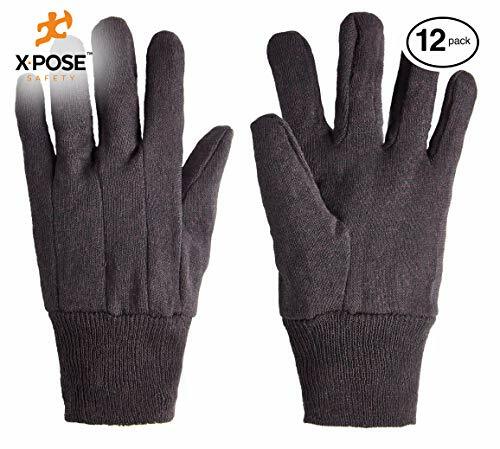 MUCH NEEDED PROTECTION: Guard yourself against dirt, grime, cuts, accidents, and all sorts of damage while doing manual work with a pair of gloves that ensures premium protection. STRONG MATERIAL: Made from highly durable jersey knit blend of cotton and polyester, for the toughest manual jobs out there for enhanced performance, dexterity and long-lasting use. COMFORT & WARMTH: Not only are the gloves soft, comfortable, lightweight and easy to work in, they are also fleecy and warm for those outdoor jobs in the winter and cold weather. MULTIPURPOSE: The protection and warmth our gloves provide are second to none and great in a bunch of situations - construction, gardening, shipping, factories, cleaning, and more! BULK SUPPLY: Included are 12 pairs, perfect for businesses and warehouses, or for a long lasting supply at home. These soft gloves combine superior protection and luxurious comfort. If you have any questions about this product by Xpose Safety, contact us by completing and submitting the form below. If you are looking for a specif part number, please include it with your message.